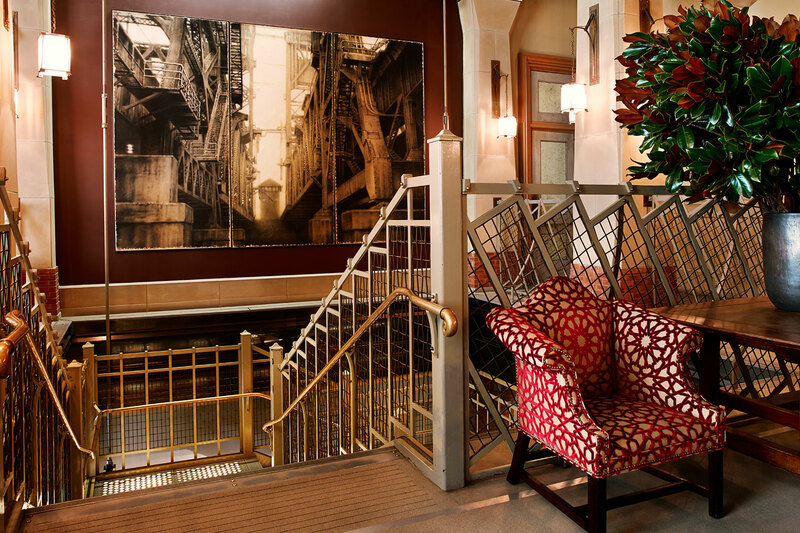 Like the neighborhood itself, Soho Grand is home to a bevy of original artworks. Bill Sofield worked with New York photographer Andrea Stern to introduce art into the hotel, bringing in everything from photographs to sculptures. Above the Grand Staircase, she commissioned a dramatic 10ft x 14ft conté crayon drawing by artist Joseph Stashkevetch, unveiled at the hotel’s opening. Sculptures of canines can be found throughout the hotel as well, emblematic of our ardent love for animals. Starting on the lower lobby, guests are greeted by two steel Great Danes guarding the base of the extraordinary bottle-glass staircase. On the second floor, two brass Whippets are flanked on either side of Reception, and on the 17th floor, the Lofts are kept company by two stoic ceramic Labs. Inside all of the guest rooms, suites and penthouses are original black and white photographs provided by the Howard Greenberg Gallery, shot by famed New York photographers from the 1940s and 1950s. These iconic images illuminate the motif of old New York and artistic legacy of SoHo. In the guest rooms, an appreciation for artistry is visible in the selection of custom and vintage pieces and in the workmanship of the cabinets, desks and wire glass mirrors. Sofield brought in sculpture tables to sit bedside and corseted leather Eileen Gray desk chairs to sit up along copper penny tables and wire-glass desks. In the bathrooms, towel racks are inspired by Paris metro station rails, and the playful wall coverings are by famed New Yorker illustrator Saul Steinberg. In the suites, inventive coffee tables are made of recycled newspapers and the dining tables are inspired by artist Jasper Johns’s renowned “target” paintings. Club Room’s permanent photograph collection comes courtesy of SoHo’s Morrison Hotel Gallery and features images from famed photographer, Terry O’Neill. Recognized for his candid documentation of the celebrities and fashion styles of the 1960s, O’Neill’s oversized images in Club Room are mounted directly on bronze metal.